Click here for a Google map marked with the various points of interest listed below. Please see the Lambert-St. Louis International Airport Ground Transportation website for information about Downtown St. Louis/Hotels Shuttle services and Public Transportation via St. Louis’s Metro Link light rail system. The Metro Link station closest to the Hilton St. Louis Downtown at the Arch is located at the Convention Center on the corner of Washington and 6th Street. It’s a six-minute walk according to Google (approximately four blocks). For information about the Jefferson National Expansion Memorial, aka the Arch, please see the National Park Service website. The Old Courthouse is located near the Hilton St. Louis Downtown on the corner of Chestnut and 4th Street. Noted for the famous Dred Scott (1850) and Virginia Minor (1873) cases, the Old Courthouse would have been in use, while also under construction, when Sedgwick visited the city. The Old Cathedral is another historic site of note, as is Laclede’s Landing (though quite touristy). As was true of St. Louis in the 1850s, the city is currently undergoing a variety of major construction projects. Interstate 70, which crosses through the heart of downtown by to the Arch, has been rerouted to a new bridge across the Mississippi. The City, State, and Federal governments are in the process of covering the old freeway (which is now an extension of Interstate 44) and turning it into a tunnel. The Arch Riverfront is still accessible on foot from the Hilton via Pine; however, you will be walking through and over the construction zone. Once you have crossed the freeway, the grounds are quite beautiful. For groceries, sandwiches, etc., you should check out Culinaria, the downtown location of St. Louis’s local grocery, Schnucks Market, located on the corner of 9th Street and Olive. If you’re looking for St. Louis Bread Company (Panera Bread), it’s three short blocks away on 6th Street near the corner of Pine. We’re planning to head to Baileys’ Range after our Riverboat ride and Arch tour on Thursday evening. The 2014 Catharine Maria Sedgwick Society Symposium, “Great Excursions: Travel and the 19th-Century Literary Imagination,” will take place June 4-7, 2014, at the Hilton St. Louis Downtown in St. Louis, Missouri. 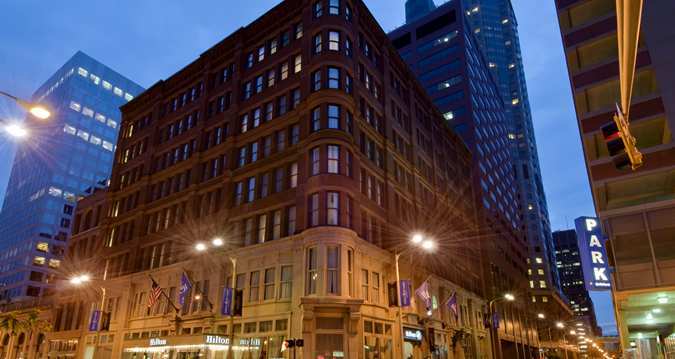 A block of rooms has been reserved for symposium guests at the Hilton St. Louis Downtown, which is offering a special conference rate for our attendees. To reserve a room at the conference rate, book by May 14th using this link. Note that you can travel from the airport (STL – Lambert Field) to the hotel via St. Louis’s light rail system, aka Metrolink. We will probably run out of rooms for the Saturday night, and the special registration system kicks you out into the regular system (at a higher rate) if you request a room for a night that is no longer available. If that occurs, try again for the Wednesday, Thursday, and Friday nights (4-7 June 2014) but without Saturday included. If rooms are not available at the Hilton for Saturday night, then we suggest that you reserve a room at an airport hotel for 7-8 June 2014. Though we will not have shuttle service throughout the Symposium, we will be able to drop you at any of the airport hotels after our Saturday afternoon/evening tour of Harriet Hosmer’s art. Please contact Jill Anderson for help with reservations at the Hilton or with other questions about St. Louis.